Dell KACE recently introduced a new series of System Management Appliances targeted at small businesses with 20-200 employees. The Dell KACE M300 Asset Management Appliance is designed to deliver an affordable, plug-and-play IT asset management solution that reduces the repetitive, time-consuming task of managing PC inventory and software licenses. The M300 qualifies as a robust yet easy-to-use asset management solution—saving these businesses time and money, while at the same time addressing their compliance and inventory management issues. Dell acquired KACE, which designs and builds systems management and deployment appliances, in February 2010. KACE solutions are available both as physical appliances (delivered as a pre-packaged hardware and software appliance) and as software-only virtual appliances, which customers can buy and load onto servers they already own. Dell’s KACE appliances are designed to perform processes ranging from initial computer deployment to ongoing management and retirement. Higher-end Dell KACE products (K1000 and K2000) have been available for some time. Since Dell acquired the company, sales have spiked considerably year-over-year. However, the existing KACE offerings are designed for companies with 100 to 10,000 employees, and cost more than most small businesses are willing to spend in this area. With the introduction of the M300, Dell is making a play in the true small business market, targeting customers that want a simple plug-and-play appliance to meet both hardware and software asset management needs. The M300 is designed for smaller businesses that often have a part-time IT manager, typically overloaded with installing software and keeping systems and client devices up and running, and frequently unable to keep up with the detail-oriented task of tracking hardware and software assets. Many small business IT managers are still trying to manage assets and software licenses manually with spreadsheets. While manual tools provide a point in time snapshot of a network, the information rapidly becomes obsolete as computers are added or additional software is installed on existing systems. IT managers either end up spending too much time trying to keep this up-to-date, or end up with outdated asset inventories. Offloading the labor-intensive minutia involved in this job can free them up to focus on more important things. 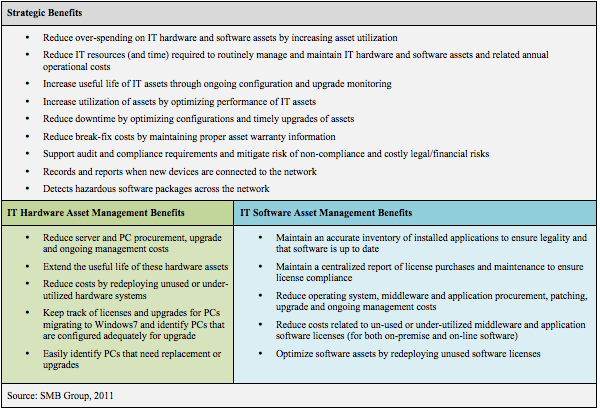 Although there are some free and small business oriented solutions available, Dell’s strong market footprint and direct relationships with existing small business customers provide it with a significant go-to-market advantage, and the opportunity to educate small businesses about the benefits of investing in IT asset management (Figure 1). In line with small business requirements to keep it simple, the M300 features easy set up. The IT manager plugs the M300 into the network, and the device automatically scans and discovers all the attached devices, obtaining information like system names, IP addresses, vendor, models numbers, memory and disk space, etc. In addition to the hardware configuration, the M300 keeps track of all the software licenses, on what systems the software is installed, versions of the software and level of patch updates, etc. The M300 continuously tracks computers and software, and can report accurate information in real-time and for compliance purposes at a specific point-in-time. The appliance’s web-based intuitive user interface shows real-time information on all of the monitored parameters. It can match the installed software with the number of software licenses purchased and authorized users. It provides online or sends out reports and/or alerts on any monitored parameters. For example, an alert will be issued if an unapproved application is downloaded and installed on a monitored PC or whenever a new PC is connected to the network. Priced at $2,498, the M300 includes a one year warranty and supports a maximum of 200 nodes. Assuming the useful life of the M300 to be 3 years, we estimate the cost to monitor each node (desktops and servers) on the network at approximately $0.49 per month per node in a company with 200 nodes. 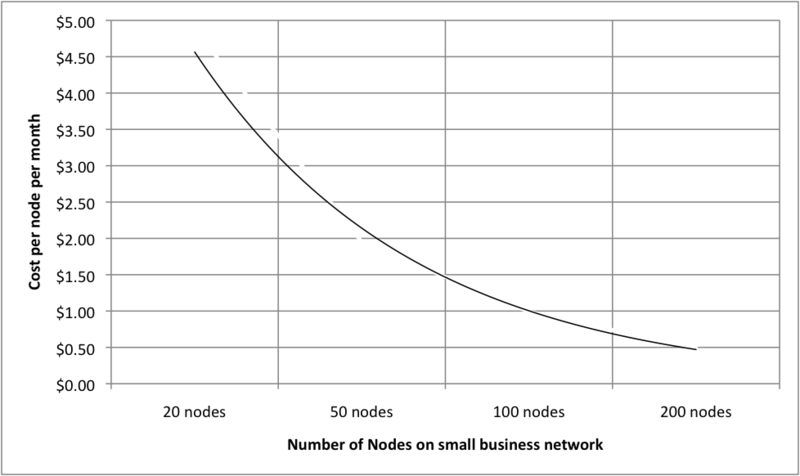 Figure 2 shows the estimated cost per node in companies of various sizes (according to the number of nodes deployed). Given the cost of a employing an IT admin to manage systems full-time (approximately $75,000 per year), the M300 will pay for itself in about one month. In addition, the M300 can relieve the pressure and any additional costs related to non-compliance in terms of number of software licenses, etc. The M300 is compact–measuring just 1.52 x 5.79 x 5.79 inches, connects to the network via a single gigabit Ethernet port, and is currently available in the U.S. only, both direct from Dell and via Dell partners. KACE has added about 100 new certified partners since Dell acquired it and currently has 143 channel partners in North America. KACE is aggressively recruiting new partners to help it expand its footprint and reach Dell’s large customer base in the small business segment. Dell’s future plans for KACE small business solutions include additional appliances that can be stacked on top of the M300 and will address time consuming IT management functions like OS installs, remote management, mobile devices, service desk, etc. As the systems management needs of these small businesses expand, Dell intends to help them manage this growth without the need to rip and replace their current solutions and investments. Incorporating capabilities to manage non Windows-based systems, clients and networked storage devices. Enabling remote management features to allow channel partners to offer incremental value-added IT infrastructure management services. This would not only have appeal for customers, who like to have a one-stop shop, but for partners, that can build higher margin services on top of the M300. Looking at the larger picture, the KACE M300 provides further evidence of Dell’s deepening commitment to small businesses. The company continues to invest in and build innovative yet practical solutions that address real small business pain points without breaking the bank. Small businesses increasingly rely on technology to run their businesses, and Dell’s focus on supplying them with easy-to-use solutions such as the KACE M300 to help manage this technology is on the mark.